What is Pet Gear I-GO2 Traveler Pet Carrier? 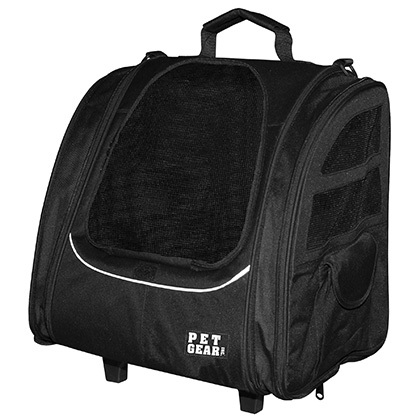 The Pet Gear I-GO2 Traveler Pet Carrier is one of the most versatile of pet carrier systems. It serves as a pet carrier, rolling bag, tote, backpack or car seat. The Pet Gear I-GO2 Traveler Pet Carrier allows you to take your pet with you on short trips around town or on longer trips in a car. It offers a fashionable design, and allows you to expand the sides 3" for ultimate comfort. The Pet Gear I-GO2 Traveler Pet Carrier has an interior fleece liner and comes with an interior tether that attaches to your pet's harness for safety. It also comes with two side pouches for your pet's accessories, and a telescopic handle and bottom wheels in order to pull him or her through malls or other crowded venues. The Pet Gear I-GO2 Traveler Pet Carrier comes in five different colors and can fit small pets up to 20 lbs that properly fit the dimensions (see Size & Color tab). The Pet Gear I-GO2 Traveler Pet Carrier is a 5-in-1 system that allows you to carry you pet with you a number of different ways. It transforms from a shoulder pet carrier to a backpack, car seat, and even a rolling pet bag. Take your pet with your anywhere in comfort with the expandable sides that give your pet 3 extra inches of "leg room". In addition, the Pet Gear I-GO2 Traveler Pet Carrier comes with a comfortable fleece liner that relaxes your pet, and an interior tether strap clips to your pet's harness so he or she can't jump out. So, the next time you want to travel with your pet, the Pet Gear I-GO2 Traveler Pet Carrier can help you travel with your pet in comfort and style. For complete directions on assembly, please see Pet Gear I-GO2 Traveler Pet Carrier Instructions. When not in use, store your Pet Gear I-GO2 Traveler Pet Carrier in a corner or on a shelf, away from children and pets. Make sure your pet is 20 lbs or under, and measure to ensure your pet fits the dimensions of the I-GO2 Traveler.